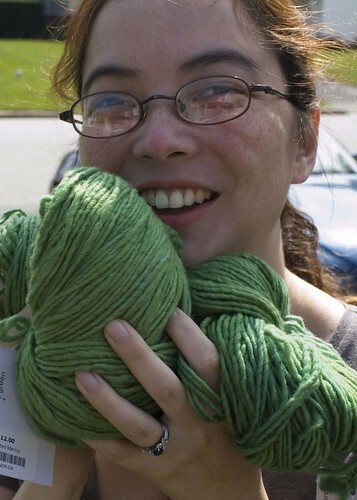 ninja kitten: Met Jared Flood And All I Got Was Yarn! This post goes to out to making Sophy envious! As I had not seen Helen in about a week and a half, I contacted her to make plans to eat and knit and pet kittens. She suggested that we attend Jared Flood's meet and greet at Loop, and, after a quick discussion of feasibility with Paul and Nathan, it was decided. We were very late getting there, which was all my fault due to a combination of Nathan and traffic, but it turns out that this was for the best. By the time we got there, no one was around! There were about five other knitters there besides Helen and me. We spent several minutes browsing the store and talking about visiting Spool before Helen tried to egg me into meeting Jared on the basis that I was the 'better' knitter. This is a complete lie as Helen has probably knit more than me by now and she's actually knit some of Jared's designs. I hesitated on sitting near Jared and lingered over at the sock yarn area and tried to push her to sit first, but Helen kept going on about buying yarn for another knitting venture. After a while, the owner of Loop noticed our odd behavior and tried to push us both into sitting at the table. I ended up grabbing some Madelinetosh Tosh Sock to avoid sitting. 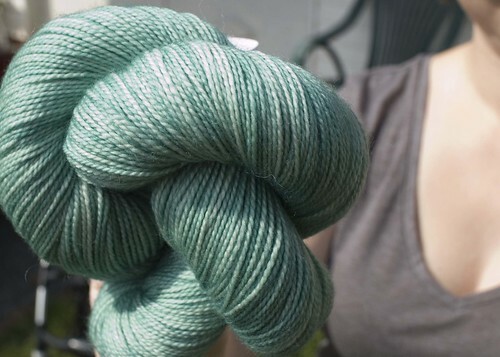 I mean, it's super pretty and I love me some semisolid sock yarns (colorway Clover), but at least fifty percent of that sock yarn purchase was bashfulness at meeting people. See, here's the thing you need to know about me. I hate meeting people. I'm not sociable in person and I have few social skills. I tend to alienate people I've just met by being standoffish or super opinionated or shallow. I make jokes that are offensively cold. A lot of people dislike me upon first meeting me, and I've had this verified by people who have later become my friends! Knowing all this about myself has made meeting people even worse. I just hate being in group situations with people I don't know. I am always sure that the second I sit down, there's something about my face or voice that makes people dislike me. I did not want to sit anywhere near Jared Flood or the other knitters or the owner. However, after a few more minutes, I realized I couldn't avoid sitting at the edge of the table, so I did. I talked with a nice guy named Alex about where we both lived. I forgot to tell him that I really liked his t-shirt. Helen joined me shortly after, but I needed to buy my sock yarn then. When I got back, she was in the middle of the table discussing her food blog with everyone. (Helen's a serious Philadelphia food blogger. She's got mad Twitter followers and she meets with all kinds of other food bloggers.) I finally sat down at the table again and started talking with people. No one seemed to hate me, and everyone was interesting, and we stayed until closing. This meant no Spool for me, but I hope to go back down on another Friday. I did forget to tell Jared Flood (who is kind of a cutie and I'd probably die of embarrassment if he saw that, but he will never see that I said that because no one besides ten people read this blog) that I want to knit Girasole. That would be such an awesome blanket to pull over oneself in the middle of winter, as one lounged in front of a roaring fire with a bagful of hot chestnuts. Don't you love how I create these picturesque scenes in my head? After all this was done, Helen and I got some Indian pizza (DELISH!) Then, we went to pet the kittens and knit and watch Glee. Are you watching Glee? If not, what is wrong with you? Do you not like fun and music and dancing and joy? Helen also presented me with a belated birthday present. I took it outside and cuddled it today. Is that Malabrigo you see before you? 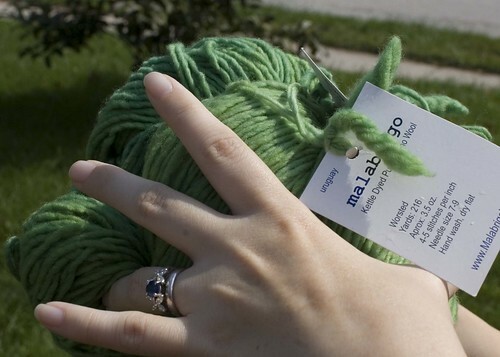 Yes, it is three skeins of Merino Worsted in Sapphire Green and it's for Shalom. I do dislike the name of the colorway because sapphires are most commonly blue. Here you can see a real sapphire and the yarn. Are they the same color? I had a fun Friday night, got some great yarn, and tried to blog about my latest pair of knit anklets. Unfortunately, every series of photos I've taken has come out blurry, so that'll have to wait. But, please note that I'm back down to one WIP! So exciting a life! OK - I am pretty much jealous on all counts. Jared Flood, Malibrigo, Sock Yarn, a kid-free day out at Loop. I'll just be depressed for the rest of the day now . . . I'm glad you posted this instead of me, becauee basically all I had was "Jared Flood is a lot younger than I was expecting. And cuter." I'm taking a class from Jared on November 7. I am so stoked. :D I'm a bit jealous of him as we're the same age and he's so accomplished, but he has a few years on me knit-wise. And yes, he is adorable. As for social issues, I'm the same way. But being 1200 miles from home, I'm being forced to put myself out there a bit more or I'd never talk to anyone. One of the most common things I've been told by people who eventually became friends was, "At first, I thought you hated me and wanted me dead." Gives you warm fuzzies, doesn't it? Apparently, I come off as hostile and angry, but in reality, I'm scared out of my pants and extremely anxious. i AM jealous! i want to knit everything Jared Flood designs. i love the green color! but, i think i've fallen out of love with malabrigo worsted. the sock and lace weights still have my heart, though. @Helen -- I managed to fit that in here! @silvercharmster -- You're time will come, I promise. You should still come up so we can visit Yarnings though. If you want to go shopping in Chestnut Hill, we totally can, and then we can take the kids to a local place they can play so we can do our knitting.